Automobile travel isn't just the American way of life, but it's often associated with American culture. Now much of the rest of world population is also trying to adopt that way of life. Voting with their wheels so to speak in places like India and China. This pushes up worldwide demand for oil, faster than the supply can keep up. As Americans kind of pat themselves on the back for having lifestyles which much of the world emulates, that "success" makes the lifestyle less affordable. Oil now pushing 103 dollars per barrel. The price of popularity. It's being on the "beaten path." Now it's time to look for less beaten paths. Spring must be on it's way. Last Saturday was great. 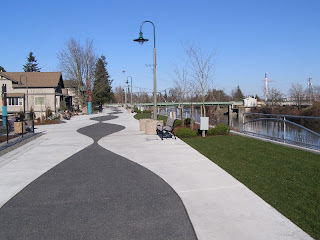 I biked up to Ferndale and checked out the River Walk. It's new. Nothing spectacular, but pleasant. Strolling in the slow lane. Nice view across Nooksack River. From Ferndale, I rode to Hovander County Park. This is what a lot of outsiders picture Whatcom County being like. 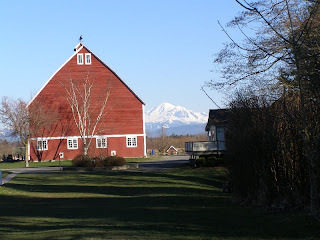 Pastoral with Mount Baker in background. More and more of the county is becoming sprawl as people tend to love the country to death. Baker is normally hidden in clouds or haze. Hoovander Homestead is saved because it's actually a park. However there is a growing farmland preservation movement in this area. 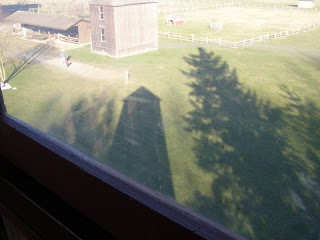 One can climb up this tower for more vista, plus the tower's shadow. Hovander is nice, but more of the county is like this (below Main St. to Axton Way); traffic. Still tolerable if there's a shoulder. 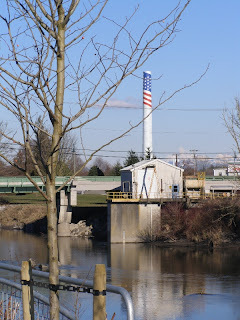 Coming back home, I took a bike trail that follows the dike along Nooksack River. It went from Hovander Park to Slater Road. Path goes on south, but Slater is a better road to come back on since it has a shoulder even though it's full of casino traffic. 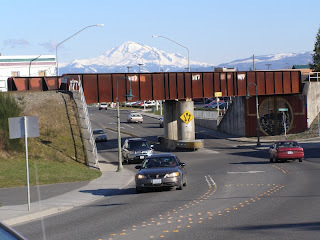 My favorite way back into town is down Bennett to Marine and Eldridge. 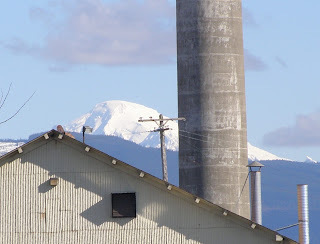 Mountain still visible behind historic smokestack of Oeser Cedar. Some people think, "toxic site." Yes, I've read some things about that cedar mill, but I forget exactly what, except it does have some local history. Did I read that this was the oldest large smokestack in town? Or maybe I'm mixing up two articles. Anyway, a leisurely Saturday on my bicycle. A friend gave me a ride down to Mount Vernon for the first part of Over The Rainbow Festival sponsored by Mount Vernon High School Gay/ Straight Alliance. It was a showing of the film "For The Bible Tells Me So" in M.V. High School's ornate old theater. There was also a very thought provoking discussion afterwards. It's great to see discussion of these issues in a high school setting. Congratulations to all the folks who put this ground breaking festival together. I wasn't able to be there for the workshops on Saturday, but glad to see the Friday night kickoff. While most of the audience was supportive of the film, there were a few folks who were critical of the film's viewpoint. The discussion was good as it went beyond just "preaching to the choir" so to speak. I sort of felt for the few opposing voices in the discussion as it must feel kind of funny being in a room of people who are mostly disagreeing with your views. As a lot of different perspectives on religion were discussed, one person ask if folks believe in any absolutes at all. Several folks offered some good responses, but I didn't say anything at all. There were a lot of ideas floating about and time was limited. Also, I'm kind of shy about raising my hand. What I would have said about absolutes would have been my thought that it's kind of presumptuous of us humans to assume that our interpretations of things are necessarily the "absolutes." Yes, maybe there are absolutes, but fundamentalists of various religions tend to think their own interpretations of things are the absolutes. That seems kind of presumptuous to me. I'd rather think we are all learning and evolving. Also I often say to people who think they know what the absolutes are this humbling concept. There's an old phrase which says, "Christians are forgiven, but not perfect." To me, this can mean a lot of room for dialog, rather than just saying "We know the absolute." "End of discussion." Another person pointed out an interesting theological point. It made an impression on me. He said (if I can paraphrase it properly). "The past has a vote, but not a veto." To me, that means when people say "the Bible says this or the Bible says that" (other religious documents also), it has input worth considering, but there's more to the equation than just "We read that you must do (or not do) such in the Bible." Ideas about ethics, right and wrong and so forth are good food for dialog and a reason to put on one's thinking cap. It was a thought provoking evening. The kind of thing I often enjoy while living my life in Theslowlane. When a business closes, sometimes the implication is to "take it easy." Can you still afford a place to reside? Housing has gotten so expensive over the past few years in many markets that it's hard for the economy to sustain it. At least there's no shortage of chairs. 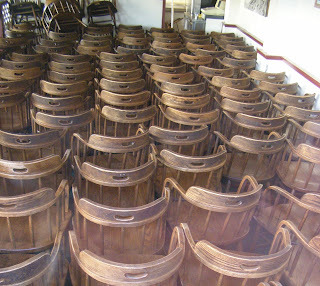 These chairs seen through a window of the old Boss Tweed's Restaurant. Building now used for catering. February 7th 2008 Sound Focus show on KUOW is worth hearing. The archives are permanent. Architecture professor Lionel Pries was highly regarded at University of Washington. Many of his students went on to design things like the Space Needle. He received a standing ovation at some national convention in 1958, but 6 months later he was out of a job. It was found out that he was gay. In many ways, the social climate was really harsh back then. The last 10 years of his life were lived in obscurity till his death in 1968; one year before Stonewall. Now it's 40 years later and the story is finally coming out. Professor Jeffrey Ochsner spent the last 15, or so years piecing together the story that's been hidden all those years. Radio Interview tells it better than me, but I was practically glued to my radio. It makes me think about how society has improved in many ways since the 1950s. Imagine what life could be like for future generations. 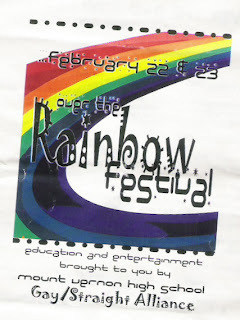 February 22-23 2008 will be an Over the Rainbow Festival at Mount Vernon High School. Mount Vernon, WA. is about 23 miles south of here. The high school has a Gay / Straight Alliance which is sponsoring this festival along with Skagit Valley Parents and Friends of Lesbians and Gays. It will be a ground breaking weekend. I often wonder what things would be like to be in high school these days. When I was in school, back in the 1970s, the word gay was hardly mentioned. Still, I went to a real progressive school and they actually did have a speaker who talked about gay rights. That speaker was invited to a civil rights and civil liberties class. For the 1970s, it was really progressive. Yes, in some ways, society gets better, but one holdover from past thinking is sure affecting us. The adage about being fruitful and multiplying and subduing the Earth. Today I pull up Yahoo News and see a story that Lake Meade may go dry in coming years. That's the big lake behind Hoover Dam on the Colorado River. All those growing cities such as Las Vegas, Los Angeles and San Diego that tap water from the Colorado River. Their populations keep growing. Also global warming is predicted to mean dryer years in the American South West; at least according to a lot of scientists. That means there could be years when the lake pretty much goes totally dry by the end of the water season. Combination of droughts and more demands for the water means trouble. I keep saying we need more gay people, or at least less procreation to enter the future. Also, of course, we need innovation. Where's Southern California going to get it's water from, in the future with the Colorado River about as tapped as it can be? Nuclear power running desalinization from the Pacific Ocean? We will need a lot of creativity, flexibility and the ability to accept change in the future. 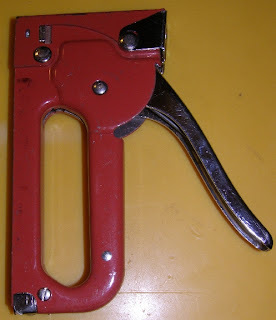 Some of the old adages will need adjusting. In many ways, it does seem like attitudes are getting better. We will need progressive thinking to survive in the future. Today, on KUOW's Sound Focus, I heard a very interesting poem by an Iraq War veteran named Brian Turner. Poem was about merging memories from the distant war with experiences in Home Depot. Ceiling fans - helicopter blades. A lot of other connections. That show is available in the KUOW archives for Sound Focus Feb. 4. Here's an interesting thing I saw at Home Depot. Actually this was a Home Base store, here in Bellingham. Now out of business. My own somewhat related experience. Just listening to what transpired around me. One day, I walked into Home Base. I seldom venture to home building stores not being a homeowner. I've never been to war either. In Aisle 12, mother calls out for her son. In Aisle 5, son starts looking for mother. Mother looks down Aisles 11, 10, 9, 8, 7. Son looks down Aisles 6, then 7. Mother looks down 6 after son has gotten to Aisle 8. "Call 911, my son's been abducted." Police response is swift, they must have been in parking lot. One can imagine, "cordoning off area, setting up a command post, bringing in the swat team?" Mom finds son just as officers enter store. Now, if only the war could end that quickly. Hair trigger fear just beneath the surface at a home improvements store. Getting lost among the stacks of products. Like the products intervene between us. And a really big danger, domestically, is driving home. Around 40,000 Americans perishing each year on roadways. Then there's the fear that the oil supply pipeline from Persian Gulf could be interrupted for one moment to harm the economy of soccer moms turned to security moms. But it isn't just moms. Lots of folks are on edge these days.